You don’t need lab coats or test tubes to learn about science. Children are naturally curious about the world around them. How do you match their enthusiasm and desire to learn with educational expectations? Achieve Now programs guide children to engage and take ownership of their learning. Through investigation, collaboration, and analysis, children learn that STEM is knowledge and practice. Children make sense of their world and learn big ideas by using common everyday objects for experimentation. Connections are made, enthusiasm for STEM grows and lasting memories formed. We nurture lifelong learners through interactive assemblies and hands-on experiences. Our 45 minute assemblies translate standards to practices with the CA Next Generation Science Standards. The students will improve their understanding of science principles with multiple hands-on activities. 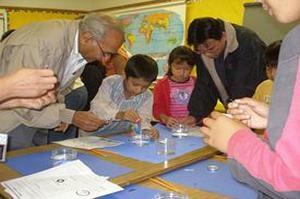 Family Science provides a better understanding of science concepts and their practical applications. 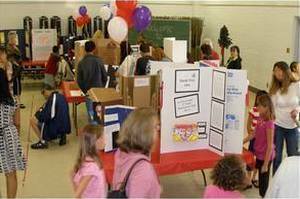 A science fair is a culminating event where the entire student body showcases their science projects. It is always fun to get to do the experiments. It is always fun to get to do the experiments. Mr. Blagden was entertaining and we got to learn about electricity. The assembly was very well organized and educational. The assembly was very well organized and educational. Mr. Blagden was entertaining which kept the students engaged. The students and I only wished we had had more time to do more experiments. The students loved being able to take home their experiments. We hope he comes back soon. I liked the assembly because the kids got to participate in the experiments. I liked the assembly because the kids got to participate in the experiments and take them home to share with their families. This assembly was very educational and it was fun to volunteer for this assembly. It was cool making the closed circuit with the battery and paper plate. I also liked creating a spark by hitting gems together. I loved the experiments. Our instructor was entertaining. I especially like being able to do the experiments. It was fun the static experiment was fun. I like being able to take our experiments home. I never knew so much about science in my life! I've learned so many things today...I can't wait to show my family all the neat things I've learned today. Thank you! P.S. Your show was funny! I never knew so much about science in my life! I've learned so many things today...I can't wait to show my family all the neat things I've learned today. Thank you! P.S. Your show was funny! Your demonstrations were funny, good, and incredible! Your demonstrations were funny, good, and incredible! I truly will do the experiment you did at home. The experiments were so cool! Thank you for showing the science performance to us. I learned a lot. I didn't have a favorite part because I thought the whole show was awesome! The experiments were so cool! What a great time the kids had. It was the talk of the school. ...Thank you so much for your dedication and enthusiasm for teaching." It was so much fun. I really like science. Can he come back? This is a fun, captivating science assembly! I liked all of the things he brought to show us how gravity and air pressure works. The experiments were fun. I was picked to do an experiment with water pressure. I turned the cup over and the water didn’t come out! I’m going to try it at home. I just wanted to take this opportunity to thank you for such a great and valuable learning experience for our school...I have had such an overwhelming positive response from parents, teachers, and students! It is more interesting to have a hands-on experience in science, instead of reading out of a text book, and you have a lot of fun while you're doing it. This morning I watched one of the best science assemblies I have ever seen. 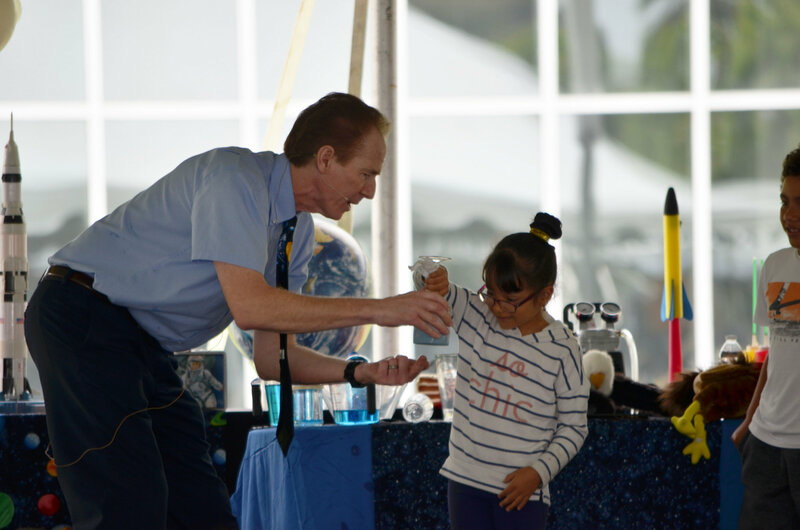 It was entitled “Our Atmosphere.” The “scientist” and educator, Rich Blagden, explained concepts to the students like, gravity, and atmospheric layers and air pressure in “kidspeak.” He used students from the audience to perform great experiments with items you would find around the house. 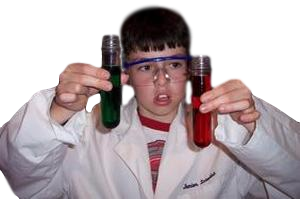 Students were encouraged to go home and replicate the experiments. The teachers loved it. The teachers even asked Rich to extend the 2nd assembly by ten minutes. I hope we have more assemblies like this one in the future. The student’s were able to physically see what they had been taught. It is always more beneficial for a student to see and test what they have learned. It is always more meaningful. It was great to work with my child and see the excitement in their eyes while learning. I liked being able to do the experiments. It is easier to remember what I learned when I get to see what really happens when I rub items together.